I've been sitting at the computer for a while now. Befriended by a blank white screen and blinking cursor. I have a topic I'd like to discuss but a part of me feels it might be too controversial. After what seems like forever, but in actuality was probably close to 6 whole human minutes (as opposed to cat minutes which I find myself thinking about more and more. For example- when we cat owners leave..like to run an errand or such...our cats must go nuts! We might be gone for a few hours, but I'm sure to them it felt like days! Days without their beloved fur-mommies and daddies?! Poor guys...Just me? Shoot.)... ANYWAY. After sitting like stated above for a while, I decided Fred Armisen said it best in a SNL skit, when he said, "So what, who cares?" The other night my husband and I went on a little date. We happen to be HUGE fans of Ikea, so we decided we'd do an Ikea/Dinner Date. Wheeeeeee! There's something so magical about that fabulous 3 story building filled with decorating wonders. I even love the smell upon entering! Am I totally losing you? So Ikea- totally fine. Loved it. Had fun. Bought a few cheapie frames and candles for some nifty craft projects. No complaints there. Here's where the complaints do indeed come in- dinner. We ate at a very popular bread, sandwich, and panini shop. I'll refrain from name dropping...but will say it starts with a "P" and everyone loves the place! Are you still with me? Hooray! So glad you didn't snort with total disapproval and click the "x" closing this tab pronto! I know I know- there's like a bajillion "P" lovers out there and believe you me, I really want to like "P" too!!! I do, I do! But, and maybe it's just me and horrible timing- every time we head to a "P" for some yummy food- we leave totally disappointed! Like wishing-we-never-entered-in-the-first-place-sadness across our unsatisfied faces. Please be honest- is this just me? I mean I've tried like 3-4 different establishments and a plethora of different menu items and none of them have been yummy! Maybe the saddest part of all is that I still go back. I go back time and time again because I still continuously see splattered across all of my social media sites, friends at their local "P" eating these delicious looking paninis and soups and drinking gorgeous looking cups of iced tea. So, come our time to head to lunch or dinner we try another location hoping for the best. But leaving so sad. Again, I don't know....maybe it's just me. Maybe my expectation of a hot pressed panini being...well...hot...is too much. Maybe when I order a tomato and mozzarella panini, I shouldn't want the cheese to be melty and gooey. Maybe I should want that mozzarella cold and almost eraser like? When we decide on a yummy sounding Cuban Chicken Panini maybe we were setting ourselves up for disappointment when we thought it would come warm on the outside and the inside. That it would taste like something more than chicken and...that one pickle inside. Again, maybe just me. To each their own I guess. Maybe I'll try heading to the exact "P" these friends are going to. I do love a good panini and would love to finally enjoy one from this place! Let's talk frosting. Not just frosting but buttercream frosting. MmMmMm love that word- buttercream. It just sort of rolls off the tongue like a good delicious sounding word should. I happen to love a good buttercream. Might be one of my favorite frostings out there. It's so versatile too! 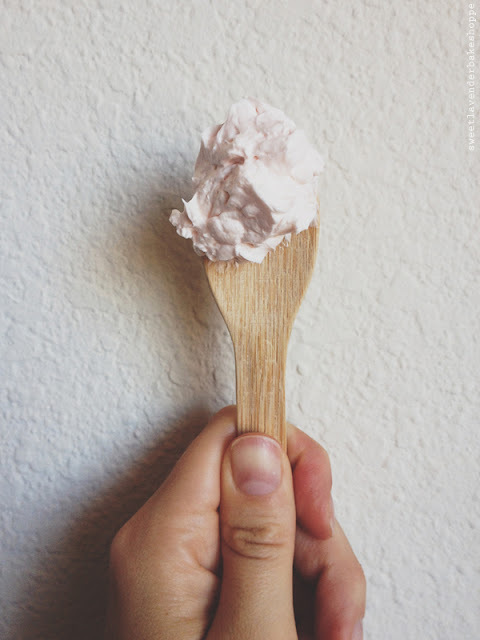 Once you've made a base of vanilla you can practically flavor it any which way you like! I typically stick with a Swiss Buttercream (as apposed to American, French, and Italian- maybe I should write a post on the differences, soon....) because it cooks the whites while still being on the easier side of how to make. This time, I chose pink lemonade as a flavor. Zing! Fluffy, silky smooth, almost cloud like satiny in texture- sweet with bursts of tartness from the fresh lemon? YUM. Then of course tinted the slightest hue of pink...it's a win win. I like to use one to two drops of Americolor's "Deep Pink". Be careful- a little goes a LONG way. 1. In your stand-mixer bowl, whisk together your egg whites and vanilla sugar. Create a double boiler with a pot of gently simmering water and this stand-mixer bowl. Of course you could alternately use a regular bowl- metal or glass- in place of a stand-mixer bowl, if you are choosing to make frosting with a hand mixer. 2. While water is gently simmering and bowl of egg whites and sugar is on top, continuously whisk together until sugar granules are completely dissolved. You can find this out by sticking a finger in the mix and rubbing mixture between two fingers. If it feels completely grain-free, you're ready! Any sand-like feeling? Place back on simmering water, whisking, and cook a few minutes more. Careful, you do not want to cook those egg whites! So make sure water is gently simmering, not touching bowl whatsoever and that you cook until those granules are just dissolved! 3. Once sugar is dissolved, place mixer bowl back on stand-mixer and with your whip attachment whisk on medium high speed. Add your pinch of sea salt. Once froth develops, turn mixer up to high and continue to whisk egg whites until stiff peaks form and the bottom of your mixer bowl is COMPLETELY cool to the touch. This could take 10-15 minutes depending on how long you cooked the mixture prior. 4. Once your egg whites have become stiff and your bowl is cool, turn mixer back down to medium low. Add your vanilla extract and lemon zest. Next, one cube at a time, add your almost room temperature butter. Continue mixing and adding butter until all of the butter has been completely incorporated. 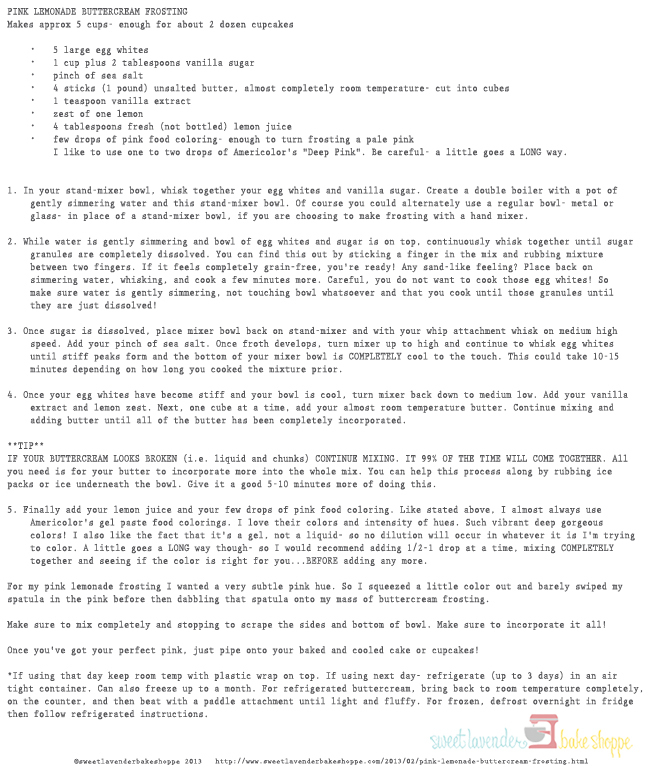 IF YOUR BUTTERCREAM LOOKS BROKEN (i.e. liquid and chunks) CONTINUE MIXING. IT 99% OF THE TIME WILL COME TOGETHER. All you need is for your butter to incorporate more into the whole mix. There's two downfalls to homemade french style buttercream: heat and cold. Both can help it and hurt it (and a buttercream master knows how to use both to their advantage).If it's too soft- maybe the egg white mix was too warm...or butter was too soft- and butter is melting- it will cause your buttercream to break. By using those ice packs/ice bath help to firm up the butter, it should bring the buttercream back together. If the butter was too cold when added- it will take the time it takes for butter to soften to come together. So you'll need to determine which one it was. Too cold- let mix at room temp for a long time. Too warm- chill it up. 5. Finally add your lemon juice and your few drops of pink food coloring. Like stated above, I almost always use Americolor's gel paste food colorings. I love their colors and intensity of hues. Such vibrant deep gorgeous colors! I also like the fact that it's a gel, not a liquid- so no dilution will occur in whatever it is I'm trying to color. A little goes a LONG way though- so I would recommend adding 1/2-1 drop at a time, mixing COMPLETELY together and seeing if the color is right for you...BEFORE adding any more. For my pink lemonade frosting I wanted a very subtle pink hue. So I squeezed a little color out and barely swiped my spatula in the pink before then dabbling that spatula onto my mass of buttercream frosting. 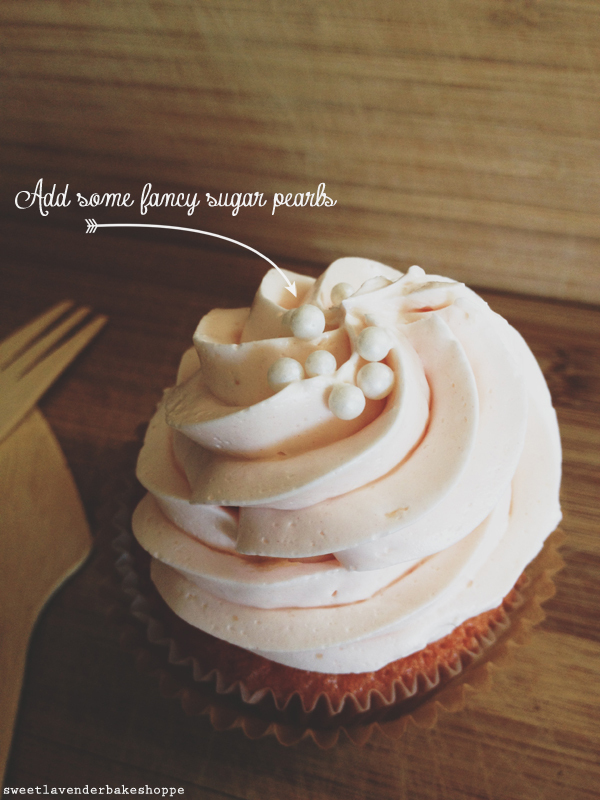 Once you've got your perfect pink, just pipe onto your baked and cooled cake or cupcakes! *If using that day keep room temp with plastic wrap on top. If using next day- refrigerate (up to 3 days) in an air tight container. Can also freeze up to a month. For refrigerated buttercream, bring back to room temperature completely, on the counter, and then beat with a paddle attachment until light and fluffy. For frozen, defrost overnight in fridge then follow refrigerated instructions. 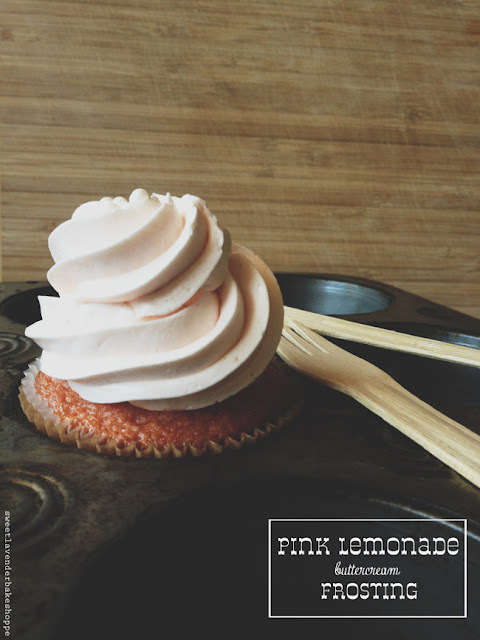 Since I love cupcakes of all shapes and sizes, I decided to use a star tip and pipe my freshly made buttercream on a batch of cooled pink lemonade cupcakes! Hmmm...maybe I should share that recipe as well?!?!? Decorating was simple- I just sprinkled a couple of white pearlescent sugar pearls (these to be exact) in the very middle of my frosting. I love the idea of this frosting, it sounds immense. I must make it asap! I do actually adore the P store in question! I never get disappointed. Especially when hungover - the cheese, ham, bacon & tomato pastries and BLT sandwiches are amazing. But it's not for everyone. I do like the P restaurant, but mostly because I like their baked goods. I mean their sandwiches and soups are fine, but nothing extraordinary. My husband isn't a fan, so we don't go often, so it's more of a treat for me. And my husband's grandma gives me lots of gift cards to P. Can't pass up free food! I just found a recipe for pink lemonade cake... so your buttercream will be perfection! I have also been to the P many times and found it bland and disappointing. Luckily there is a similar type deli near me that is awesome. The paninis are gooey and hot and yummy and the soups, sandwiches and salads are fantastic too! Iced Tea? Addicting. Hopefully you live in one of the colored-in states on their map! Try Corner Bakery. They have a pannini with sundried tomatoes, basil, cheese, turkey and pesto...always melty and fabulous! I'm with you on "P". Years ago we lived in a ritzy, wealthy city and those stores were everywhere. Friends were going all the time (we really couldn't afford going much) but I went with some friends twice. Both times, utter disappointment. And that's when I realized two things: 1) People have different tastes and 2) Some places are all about the hype! At the risk of making this even more controversial, I feel the same way about a certain "S" coffee place. The food is mediocre at best, the coffee beans are burnt when roasting which makes for a very strong but very bitter coffee. But people go there all the time, and well, it makes me think that some people do probably like the taste, while others like the hype. And since I don't fit into either of those categories, if I'm not really craving a frappucino, then I don't go there.